Use the corrective deed to amend a previously recorded deed of conveyance with an error that could affect title. 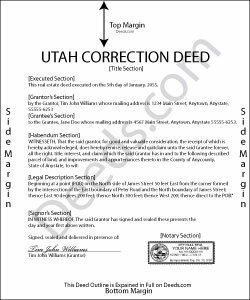 An error in a document can be corrected in one of three ways in Utah: by recording an affidavit, by re-recording the original document, and by recording a new document. An affidavit can only be effective if it clarifies an ambiguity created in the original deed. It cannot add to or take away from the effect of the original recording. There are different types of affidavits, each used to correct different issues in a document. For typographical errors, use a scrivener's affidavit. As far as correcting the legal description, omissions or obvious typographical errors that will not allow a point of beginning to be determined can be corrected by a scrivener's affidavit. However, if a point of beginning can be determined on the original document, whether or not it was the one intended by the executor of the document, an affidavit cannot change the point of beginning. Another error in the legal description that can be corrected with an affidavit is the omission of a plat of a recorded subdivision, but the omission of the section, township, or range from the description, requires more than an affidavit to effect a change. If an error or omission occurred in the acknowledgment, a scrivener's affidavit, preferably from the notary, can be used for the correction. Other affidavits are an affidavit of identity, which can be recorded by someone personally acquainted with a grantor or grantee of a previously recorded document in order to clarify that a person (a grantor or grantee) is "also known as" (aka) or was "formerly known as" (fka) another name. Finally, for an error in the survey, use a surveyor's affidavit. When recording an affidavit or when re-recording a document, include a notice containing the name and address to which real property valuation and tax notices should be sent. A re-recorded document can correct all the errors mentioned above. Apart from correcting the original information or supplying omitted information, it must be re-signed by the original parties and re-acknowledged and contain a correction statement that gives the reason for the re-recording and refers to the prior recording by date, recording number and title. Keep in mind that adding extra pages for these required items and the re-execution will increase the overall page count of the re-recording and thus may affect recording fees. By comparison, a new corrective deed may be the simpler and less expensive option to effect a correction of the record. It contains all the required elements of a re-recording within its two pages, i.e., it gives the reason for the correction, references the prior deed by date, recording number and title, and it provides a new signature and acknowledgement section. Furthermore, it presents the corrected or omitted information as part of its contents, instead of scribbled on the margins of the old deed, and for the most part, its contents restate and confirm the prior deed of conveyance. Finally, keep in mind that certain changes may require a new deed of conveyance instead of a correction deed. Among those are the addition or omission of a grantor or grantee and of parts of the property, as well as a change in vesting. Seek legal advice when deciding on the right instrument to effect changes such as these that are of a material nature.